Yes, we have covered a lot of alarm clocks here at Coolest Gadgets. Alarm clock technology has changed very little since its first incarnation, as it is just a loud sound programmed to get you up at a time that you would prefer to be sleeping. Most “improvements” are usually a louder sound, or some kind of activity to make the user alert, like the Dynamite Alarm Clock. I’ve seen one that uses scents to aid the early riser, but this was just a concept for now. 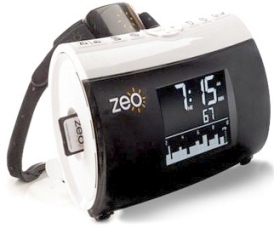 Zeo has come out with the first alarm clock device that I have seen that actually wants to help you sleep. In fact, this product is billed as a Personal Sleep Coach. Sleep coach? I’ve heard of a life coach, but this is not ridiculous. Check out more after the jump. The user of the Personal Sleep Coach must wear a headband that will track sleep patterns with a sensor. This sensor can detect electrical signals from the brain, and wirelessly transmits its results to the display. Your sleep record is saved on the SD card that you can see sticking out of it. From there, the user can upload the information to the myZeo Personal Coaching Web site, and learn about ways to improve their sleeping program. Not a bad idea. This is probably the only alarm clock that I would want by my bedside, as I sometimes have a problem with my sleeping. At last, someone has made an alarm clock that I don’t want to curse. Of course, some of you might have a problem with the $399.00 price tag.